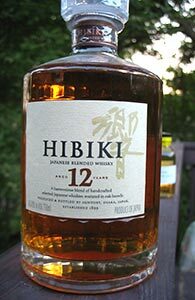 As noted yesterday, unlike the 17 yo, the Hibiki 12 is available in the US, and is perhaps now the most reasonably priced of the Japanese whiskies available here. 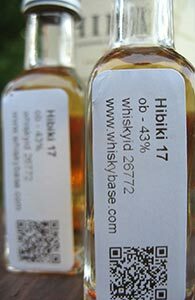 And as also noted, the marketing materials for the Hibiki 12 note that it partly contains whisky matured in casks that had contained plum liqueur. Let’s get right to it. Hibiki is Suntory’s premier line of blended whiskies. It’s not entirely clear from the description of the lineup on their website if there is grain whisky in the blend. They say, for example, that “[N]umerous types of pure single malt whiskies ageing in various types of casks, including Mizunara, a very rare Japanese oak, all combine to create a full orchestra of flavors and aromas.” No mention of grain. However, a Suntory press release from the IWSC 2013 specifies that this whisky “is blended using carefully selected malts aged over 17 years, and ripe grain malts of the same age”. What “grain malts” are is anyone’s guess but it would appear that this is indeed a blend of malt whisky and grain whisky. What the sources of the components are or are likely to be I have no idea.